Whenever mobile user moves to different network, has to change particular IP address, gateway address, subnet mask, proxy server and default printer, etc., to particular network environment. In order to do it, he has to remember TCP/IP settings information of every network. Also, he has to reboot the computer to apply it to the system and to access the Internet. Don't waste your time reconfiguring computer network settings every time you change your location. Free IP Switcher is a perfect solution for you. It switches between preconfigured network settings with a single click and without any reboot. With Free IP Switcher you can automatically change all network settings. 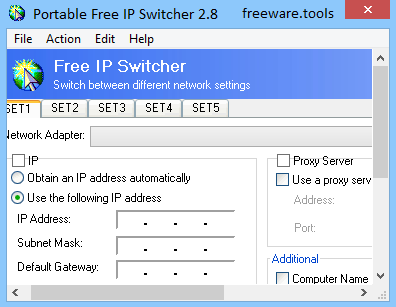 Portable Free IP Switcher is a very efficient application that allows for the creation of numerous IP scenarios between which you can switch seamlessly depending on the network you’re connecting to. Portable Free IP Switcher is the to-go version of Free IP Switcher, sporting the exact same feature set as the latter, but without requiring an installation process and leaving the system registry footprint free. Portable Free IP Switcher can be a real helper for people who use more than one connection to gain access to the Internet, providing a simple method to create IP configurations for each of them and moreover, to switch between these scenarios when the situations requires so. The advantage of doing so is that it saves you a considerable amount of time, eliminating the need to make a different configuration each time you connect to a network. Another upside is that there’s no limit to the number of scenarios you can create. Wrapped up in a simple design, Portable Free IP Switcher accomplishes more through functionality than it does through appearance and that is not a problem, but an advantage, we might add. In each scenario, you are required to select the network adapter to be used, as well as to customize IP and DNS settings, very similar to Windows’ built-in connection configuration dialog. In addition, you can opt to use a proxy server and define several other parameters such as computer name, workgroup, WINS server and so on. Each time you want to connect to a different network, all that is required is to locate the IP set that matches its settings and to press the ‘Load Current’ button. Of course, performing this via a hotkey would have been better, but this feature is not on the table yet. All in all, Portable Free IP Switcher is intuitive and easy-to-use, managing to set the mood for users of multiple connections almost effortlessly.